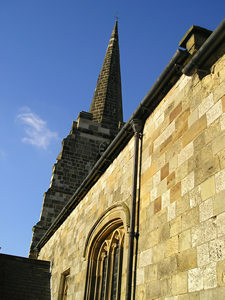 Rillington’s church has a spire on top of its tower. 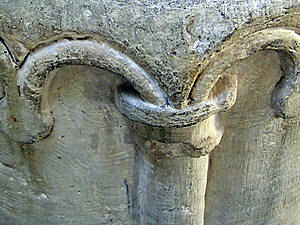 The spire seems to have caused a few problems in the past, as inscriptions inside the church relate. 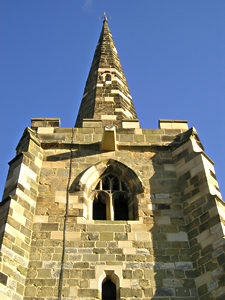 The spire was blown down in 1783 and rebuilt in 1788. It was then damaged by the Great Gale of 1839 and was repaired in 1840. It was then struck by lightning in 1867 and had to be restored again "with a conductor attached". The inscription for these 19th century incidents notes: "public subscriptions on both occasions". I bet the local people had a history of nervously eyeing the spire every time there was a storm. I visited this church not to admire its much-rebuilt spire, but because family history research brought me here. Some of my ancestors lived in these parts and this was their church, before the railway line arrived at the edge of Rillington, and eventually brought us to York. 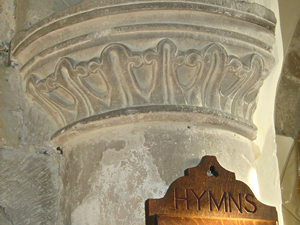 My ancestors would have been baptised in this font, above. It had already been in service for centuries before then. 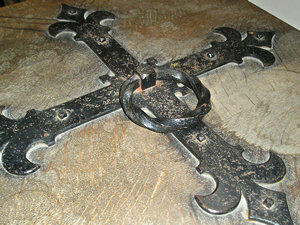 The Pevsner guide tells me it’s an early 13th century font, with a 17th century cover, shown above, right. 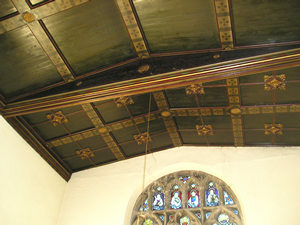 I noticed the handsomely painted ceiling (above left), which was restored and painted in 1892. General restoration of the church took place in 1884-5 (by C Hodgson Fowler), but the church is, Pevsner says, "largely old". I can’t tell you anything interesting about the little chap carved here on one of the pillars, but he looks like he might have been here for a fair while, watching the spire falling down a few times. 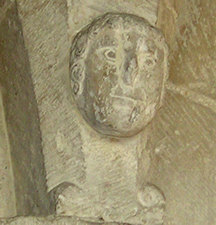 Above, carved detail from another pillar. Rillington has one of these beautifully detailed Rolls of Honour, which I’ve seen in many churches now. 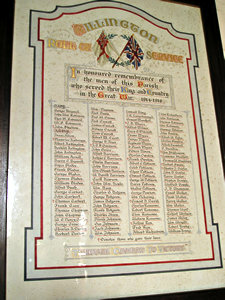 They list the members of the parish who served in the First World War. (At first, because we know the number of casualties in WW1 was so high, we assume this is a list of all those who died in the war.) A cross next to certain names "denotes those who lost their lives". The impact on a village parish of such a large number of men going to war would have been considerable, and was of course replicated across the country. I do like the way churches have features from so many centuries, all mixed in together. 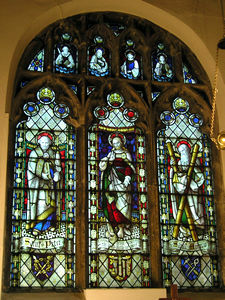 The east window, by H V Milner, pictured left, dates from 1904. 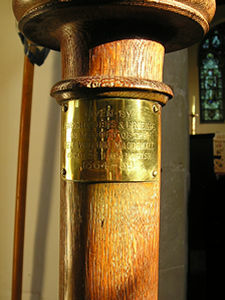 The lectern has a small brass plaque with an inscription showing that it was given "by parishioners and friends" in memory of Rev William MacDowall, vicar at Rillington from 1864 to 1889. Much, much older than the lectern plaque and the stained glass window is this small, rather faded, partial wall painting, hidden around the corner in the north aisle of the church, and dating from around 1370. 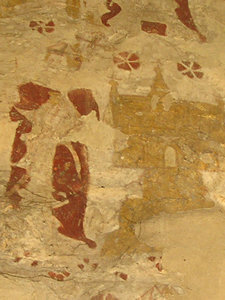 Pevsner says it is "the most important medieval wall painting in the East Riding." 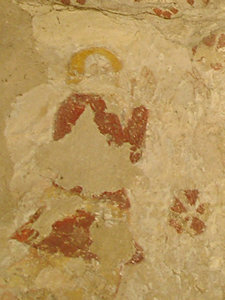 It was cleaned around 25 years ago, being indecipherable previously, and it has apparently been shown to be the only wall painting surviving showing St John of Beverley. I enjoyed my visit to this church. It felt like it was very much in use, with a carpeted area at the back with children’s toys, but also with all its record of past centuries, in its architecture and decoration. 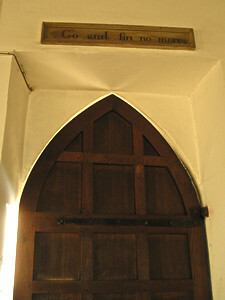 I particularly liked, as I was leaving, the painted inscription on a wooden plaque above the door. I’m not sure when it dates from, but it gives a clear message to the departing congregation – "Go and sin no more."